BRING ALL REASONABLE OFFERS. Beautiful 4.46 ACRES with cleared yards, encircled with wooded acreage, gives incredible views, great space, and your own home/getaway. Build your own garages, barns or more, and enjoy all the land and wildlife. Manufactured, double-wide home, in need of work, on a permanent foundation, with 3 Bedrooms and 2 Full Bathrooms, open-style living with great room and kitchen with peninsula and Laundry/Storage closet, waiting for the new owner. Live here and enjoy this private, tranquil, natural setting either replacing current home or putting in some sweat-equity and customizing this home to make it your home. Come see this property for yourself! Private, tree lined drive to the parking area close to the front and side doors of the home. Property to be SOLD AS-IS. All Inspections will be purchaser's responsibility and for Informational purposes only, including well, septic, and termite. Seller to make no repairs, no warranties offered or implied. 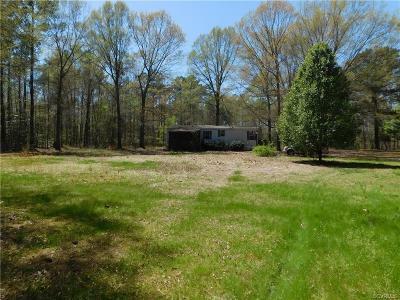 Priced well below assessment to adjust for needed work on the property. Possible 203K type loan or Cash. Enjoy living in the country, close to schools, shopping, entertainment & more. Directions: I-295s, Take Exit 28a Toward Us-60, Right At The Fork, Turn Left Onto Us-60e, Turn Right Onto Va 609s, Left Onto Rt 602, Left Onto Va 168, Property On Left, Look For Sign.